Hvorfor viker immunterapi på så få pasienter? En svært intressant artikkel her fra OncoTherapy Network, som illustrerer godt de mange problemer forbundet med Immunterapi, som i media så lett blir beskrevet nærmest som en mirakelkur for kreft. Som ved andre behandlinger, kan kreftpasienter selvsagt respondere utrolig godt på denne, men det gjelder langt fra alle (kanskje ikke mer enn +/- 20%) Og- som man hele tiden forsker på nye typer immunterapi og kreftvaksiner, så forskes det også på hvorfor immunterapi har vist seg så vanskelig i forhold til det å gi de resultater vi alle håper og drømmer om. Dette er et utrolig komplekst område, og det vil ta lang tid før forskningen kommer i mål her, men spennende er det – og det lover fortsatt veldig godt for framtidens kreftbehandlings-regime. Men noen erstatter for annen behandling, som kirurgi, kjemoterapi og stråling, det ligger nok et godt stykke fram, om det i det hele tatt er mulig. Oncologists now may have a better idea of why immunotherapy fails in such a large number of cancer patients. 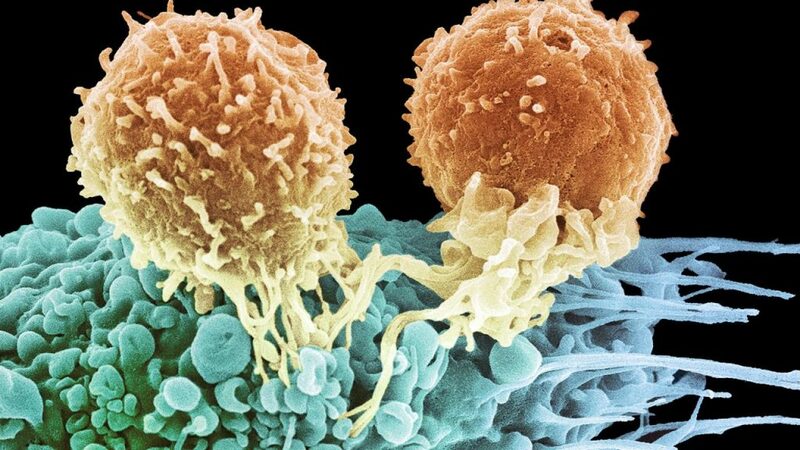 Researchers report in Nature that they have identified dozens of new genes that create T-cell–resistant cancer. The investigators used the CRISPR assay system (2CT CRISPR), a gene editing technique that examines how genetic mutations in one cell can affect the interaction between two different cell types. The researchers report that the large new gene list uncovered by 2CT CRISPR could serve as a blueprint to study the emergence of tumor resistance, and eventually to point to more effective immunotherapy treatments. “I think we were most surprised at the ability of the 2CT CRISPR screen to sift through 20,000 genes to pick out the two components of major histocompatibility complex (MHC) class I antigen presentation (HLA and B2M). This absolutely makes sense since we know that MHC class I is required for antigen presentation to the T cells, but it was a pleasant surprise to see these genes ranked number 1 and number 2 out of all 20,000 genes in the human genome,” said study coauthor Neville Sanjana, PhD, a core faculty member at the New York Genome Center and an assistant professor of neuroscience and physiology at New York University, in an interview with OncoTherapy Network. He said that another surprising finding was that across virtually every kind of tumor, there is a shared set of genes whose activity is essential for immune responses. “This core set of genes does not seem to depend on the kind of cancer or tissue of origin. When these genes are mutated, then immunotherapy will be less effective at treating the cancer,” Sanjana noted. The 2CT CRISPR screen consisted of human T cells as effectors and human melanoma tumor cells as targets. The melanoma cells were modified by CRISPR and tested for resistance by applying T cells. Researchers were able to identify which loss-of-function mutations in melanoma reduced the effectiveness of the T cells and led to immunotherapy-resistant tumors. The research team correlated the genes uncovered by the 2CT CRISPR screen with a large dataset from The Cancer Genome Atlas (TCGA), containing more than 11,000 tumors from 36 cancer types. Analysis of TCGA data suggested that there is a core set of genes important for effective immune response to cancer across cancer types, and this same core set was found in the 2CT CRISPR screen. One of the genes without a previously established role in cancer immunotherapy that the investigators identified was APLNR. The product of this gene is the apelin receptor, and the study showed for the first time its connection to the JAK-STAT pathway. The study demonstrated that loss of APLNR in a mouse cancer model resulted in poor prognosis and blocks effective treatment with immunotherapy. “The most important take-home message is that each tumor can carry unique mutations that can drastically change how a patient responds to immunotherapy. If we can figure out which mutations are present in the patient’s tumor, it will soon be possible to predict how well or how poorly that patient will respond to immunotherapies and whether we should treat with other drugs in combination with immunotherapies,” said Sanjana. Få nyheter om behandlingsmetoder, gledelige pasienthistorier, generell nyttig informasjon og mye annet som kan være relevant for deg eller dine nærmeste.